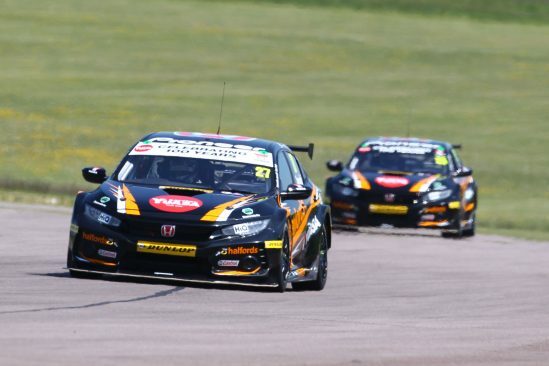 Halfords Yuasa Racing celebrated a triumphant return to winning ways in the Dunlop MSA British Touring Car Championship after Matt Neal steered the new Honda Civic Type R to a dominant first victory at Thruxton this weekend (20 May). 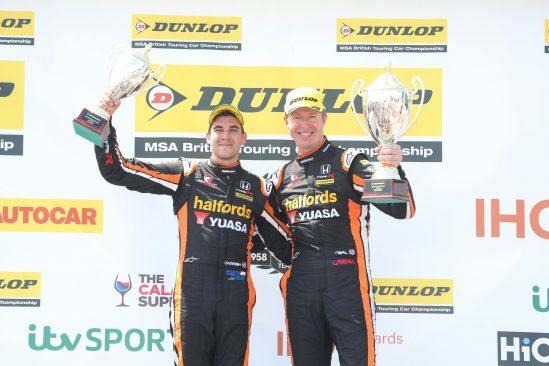 Drivers Matt Neal and Dan Cammish carried a special livery on their cars with a ‘Celebrating 100 Years’ windscreen sun strip and a vintage Yuasa Battery logo on the bonnet. The circular logo appeared on all Yuasa products sold and produced in the UK up until 1992 when it was replaced with the current ‘water tower’ logo familiar to all BTCC fans. On a breakthrough weekend that successfully demonstrated the full potential of the ever-improving Civic Type R, Neal was in impeccable form in qualifying to smash his own lap record around the UK’s fastest circuit and pick up the team’s first BTCC pole position of 2018 before translating it into a dominant lights-to-flag win. Taking full advantage of his opportunity in race one, Neal determinedly held his ground off the line and through the opening turns to get out in front and lead the pack. From there he wouldn’t be challenged again, the three-time champion pulling out a comfortable margin and controlling the pace to the chequered flag to score a hugely popular win at Honda’s home event and give Yuasa the perfect result on a weekend of 100th anniversary celebrations. Starting from pole again for race two but hauling a full complement of 75kg success ballast around Thruxton’s high-speed turns, Neal produced a mighty effort to keep many of his substantially lighter rivals at bay, ceding only two positions to finish third and pick up another podium. 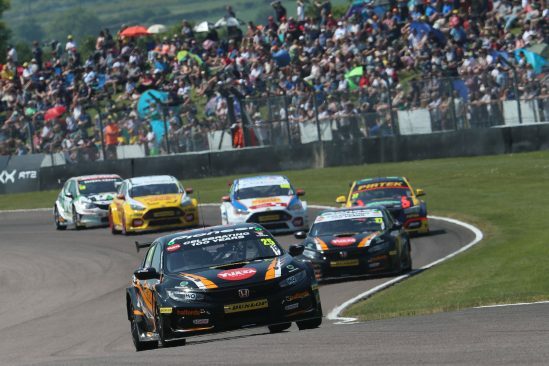 In a hard-fought finale, Neal brought the car home eighth, in so doing accumulating more points than any other driver over the course of a scorching day at Thruxton. Team-mate Dan Cammish complemented Honda’s joy in race one with a superb run to third position from fourth on the grid, his second podium result in what is already proving to be a mightily impressive rookie campaign. When an early off amidst the thick of the action in race two left him consigned to a finish down the order, the Yorkshireman responded in race three with a marvellous fightback into the points in 13th from a lowly 25th. In the overall standings, Neal’s return to the winners’ circle has catapulted him to sixth, which together with Cammish in eighth puts the Honda pair firmly in the title hunt. 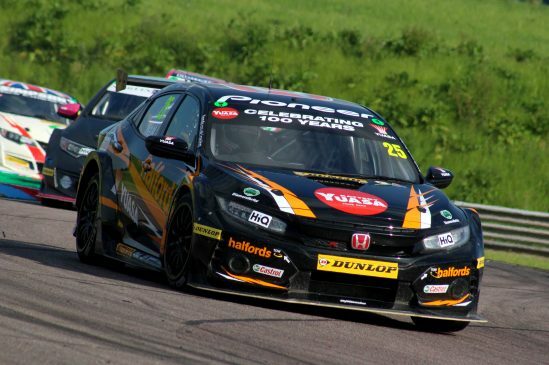 Similarly, Honda’s huge points haul sees it ascend to joint-second in the Manufacturers’ Championship, while Halfords Yuasa Racing rises to second in the Teams’ Championship heading next to Oulton Park on 9-10 June.